The flow of information in a modern day office can come and go so rapidly that it is often difficult to keep things in check. With information coming in via email, post, telephone and multiple staff members, keeping a documented record of everything that has transpired is problematic. It is, therefore, important to make sure that efficient office storage systems are in place. Having good office storage is one of the best ways to ensure organisation within a business. With a name and a place for everything, it is easy for workers to put away paperwork and equipment where they belong. More and more businesses handle their workload on computers and through emails. As a result, a lot of companies have held back on keeping physical documentation to preserve space. This is environmentally friendly and convenient however it can cause problems in the long run. When replacing computers files are often changed making it difficult for staff members to familiarise themselves with new systems. As well as this, computers are vulnerable to data corruption and loss if something were to go wrong with it. A traditional filing system is still an essential part of a good business. An organised central system that staff members are familiar with can go a long way and prevent unnecessary challenges. So where does all of this storage go? Some offices are small in size and some businesses have to downsize due to the current economic climate. Limited space can cause issues but by utilising what you have you will achieve what you need to. Using valuable floor space for storage may seem like a waste, however, there are convenient and efficient ways of organising your office storage systems whilst still maximising your workspace. The heart of any office storage system is the filing cabinet. It is an essential for any businesses dealing with a lot of paperwork. The type and size of filing cabinet you opt for will depend on the size of your company. There are options for filing cabinets with as little as two draws or as many as six draws. If using a filing cabinet it is important to also use suspension files for separating and labelling things accordingly. When it comes to preserving floor space, you don’t necessarily have to stick to the floor level. By using raised storage areas you can save at least 50% of your floor space. These include cabinets or shelves either placed at eye level or higher. Accessing these spaces will not be as convenient but they are useful for storing data that isn’t regularly used. Mobile shelving is another option to consider when looking for storage space in your office. These are groups of shelves that attach to one another on wheels. They can then push together or pull apart to look like individual shelves. To access any of the shelves you simply ‘open up’ an aisle and pick a document from it. These systems are ingeniously designed for small office spaces and offer the most space-saving method possible for storing full libraries worth of information. 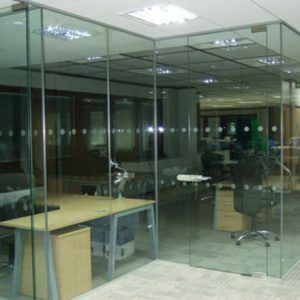 Modular office furniture is an increasingly popular option you could consider. This comprises of individual ‘building blocks’ that are fully customizable to fit any space. You can tailor modular furniture and assemble it any way you like to take advantage of any space you have free. Maximise the space you have by building corner desks or by incorporating storage space such as a cupboard into a desk area. 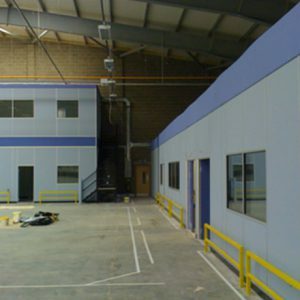 Modular office partitions are a convenient alternative to permanent walls, allowing you to alter your office layout with little fuss. 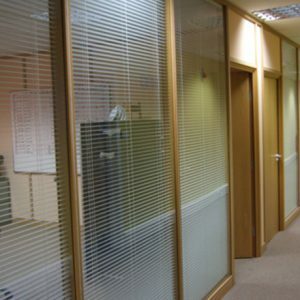 Office partitions won’t take up much floor space but will still provide the necessary privacy needed for your workspace. By looking for more creative solutions to office storage you can maintain an essential physical filing system without sacrificing too much space.